Enviro’s recovered carbon black is demonstrably a good environmental choice, according to a new life-cycle analysis (LCA) from the IVL Swedish Environmental Research Institute. 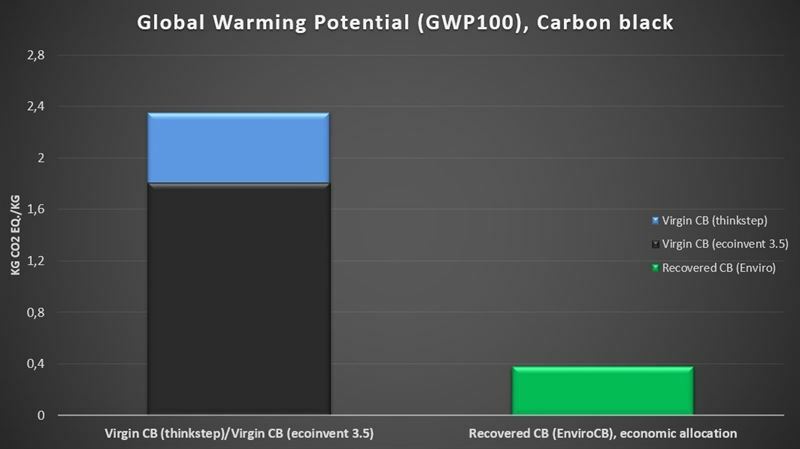 Recovered carbon black leads to CO2eq emissions that are 79-84 percent lower than the emissions from the production of virgin carbon black – a figure considerably better than earlier estimates of 60 percent. “It's fantastic to learn what great environmental benefits Enviro's recovered carbon black can bring. The whole industry is looking for materials to reduce the impact on the climate, so this is very good news, both environmentally for the industry, and in terms of the economic potential for Enviro”, says Thomas Sörensson, Enviro CEO. The IVL Swedish Environmental Research Institute, together with Enviro, has carried out a life-cycle analysis (LCA) of Enviro's recovered carbon black (rCB) EnviroCB, and the other materials that are extracted through the company's pyrolysis techniques: oil, steel and gas. The purpose of the analysis was to provide an overall picture of these materials' environmental impact, and the results show, among other things, that for each kilo of recovered carbon black that replaces virgin carbon black, total emissions are reduced by 1.43-2.00 kg of CO2. One of the indexes used is Global Warming Potential, GWP, which makes it possible to compare the greenhouse effect for greenhouse gases at a joint scale with the greenhouse effect for carbon dioxide [see graph]. LCA is a method for identifying and measuring the total environmental impact during the life cycle of a given product, from raw material extraction, through manufacturing processes and use, and up to the waste management stage, including all transports and energy expenditures that occur in between. The LCA done by Enviro and the IVL Swedish Environmental Research Institute was carried out in accordance with ISO 14040/14044 for life cycle analysis. Scandinavian Enviro Systems AB (publ) is required to publish this information under the EU market abuse regulation. The information is provided by the contact person listed above for publication on March 21st, 2019, at 17.40 CET.